After a highly popular run at the Hampstead Theatre, there’s been quite a buzz about the West End transfer of Caroline, or Change. With rave reviews and great word of mouth I thought this would be a sure fire hit, but I couldn’t help wanting a bit more from this musical. With a score by Jeanine Tesori, whose musical talents recently won my heart in Fun Home, I was shocked to find that the music was the out-of-place element here. I didn’t feel it was right for the piece. For a story that inspires and draws out such emotion, the individual songs seem far too bitty, short or scatty, barely allowing the audience to settle into the sentiment of one number before steamrolling into the next, although I like some of the tunes. 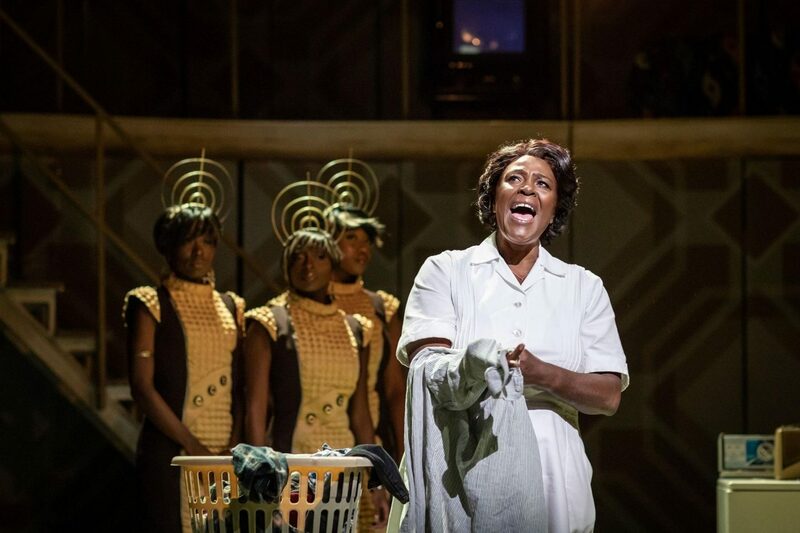 The only song that truly garners the emotional response that echoes the story is Caroline’s final solo, incredibly performed by Sharon D. Clarke, but it arrives too late to package the show as a statement piece I can connect with. Fortunately the cast make the best of this, with impressive vocals all round, led by Sharon D. Clarke. She really is a powerhouse of talent, not only bringing excellent character but an iconic sixties sound. Jack Meredith gives a mature performance as Noah while another highlight comes from Ako Mitchell’s demonic Dryer and Bus. The staging works well. The machines coming to life is an inspired representation of Caroline’s loneliness and isolation. The contrast of the high platform for the family employing her gives us the sense of hierarchy and Michael Longhurst’s direction comes into its own with the placement of characters across the levels. Noah freely runs between the two whereas his mother Rose tends to hover on the stairs or keeps linked to the top floor by the phone lead, only breaking free to discuss the money deal dreaded by Caroline. Although the musical has an important message, I can’t help feel it is hindered by the score in truly hammering home the class and race issues of the time. Good performances and direction still make this one to catch but not one to reach the top of the ‘must-see’ list. With thanks to London Box Office who supplied the ticket to the show.